The saga continues with Palm as they are doing whatever they can to attract developers and stay in competition among the other platforms. Although Palm's App Catalog pales in comparison to what the App Store or even BlackBerry App World has to offer, they are aggressively trying to get developers on board by waiving their usual $99 fee which is required for developers to publish their apps. 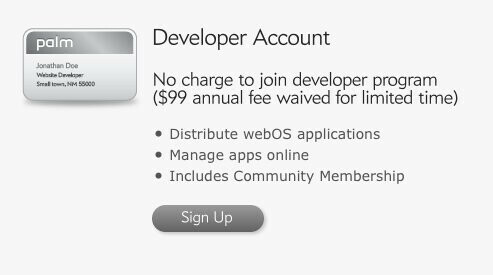 That membership fee would allow them to distribute webOS applications, manage apps online, and includes a community membership. As much as this might sound like something set in stone for good, Palm is only doing this for a short time to see what kind of outcome would occur by this move. If there is a drastic change in the amount of developers on board, they would most likely keep steady by waiving the fee. If not, then it would revert back seeing that it'd be somewhat unforgiving if they could somehow profit from it. All in all, developers most likely won't hesitate to get their apps into the App Catalog due to the fact that the fee has been waived – so hopefully it'll spur some quality apps that were never given a chance to see day light. This is a great move for Palm to encourage development, but this should have been done much, much earlier. It was, it's been free for a month and a half, the news story should have been done much, much earlier.